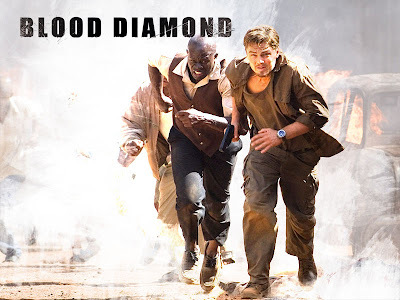 Blood Diamond is about a smuggler who came to know of the “pink” one when he met a fisherman while in jail. In an attempt to retrieve the rare diamond, the pair’s journey became a matter of life and death. One might think that his film is nothing more than an action flick about the adventure of Danny Archer (Leonardo DiCaprio), diamond smuggler, and Solomon Vandy (Djimon Hounsou), fisherman, in their effort to retrieve a rare diamond. While that is the main plot of this film, the film actually reflected larger issues about the trade of conflict diamonds in Africa that funded rebel activities against the government. It also explored questions about human nature. The atmosphere of the film was made intense at the start. Scenes of violent killings by the rebels erupt at Vandy’s village. Danny Archer wit around his diamond negotiation with the rebels. The Conference of Diamond in Belgium highlighting the seriousness of the conflict diamond trade. What captivates in Blood Diamond is how well Director Edward Zwick portrays the main characters in the film. DiCaprio sheds his usual pretty boy role in previous film to make a good account as the “white man in Africa” smuggler who grew up in Zimbabwe and learned his trade as an ex-soldier. Knowledge of his background answers how he was able to get his way around civil war ridden Sierra Leone. The bond between him and fisherman, Vandy, grew as the film progresses. And there is also the romantic relationship between him and journalist, Maddy Bowen, played by Jennifer Connelly. For the male fans, Jennifer Connelly is, as what another journalist in the film described as hot. Her character, Maddy Bowen looks gorgeous no matter the situation in adverse conditioned Sierra Leone. She looks good, really good. Maddy is clever, strong and has the ambition to help the people by having a real story that can really make a difference. Then there is Solomon Vandy, the fisherman who got separated with his family when the rebels overran his village. He escapes narrowly without having his arms severed and was made to work at the rebel’s diamond fields. He is the one who uncovered the “pink” one. The father and son relationship with Dia, is heart warming as he with the help of Archer and Bowen attempts to reunite his family only to discover that his son had fallen into the hands of the rebels. The main characters in the film closely interlink with one another, making use of each other in the beginning but later found a bond among one another. There are sufficient gun fighting actions to keep the film noisy. And the tension between the characters made the film lively. The story might be fiction but the situation where it unfolds is real. The dialogue is well written. I enjoyed the conversation between the characters. They made the film worth remembering. And there were also humorous ones that lighten moments, giving the pace of the film its highs and lows. On a particular scene, Archer asked Vandy, “What do you catch mostly?”, and Vandy’s reply was “Fish.” Brilliant. The film also showed the vulnerability of men. The sad truth of child soldiers, taken from their families and were psycho conditioned by the rebels to use guns and take drugs. They were made to do terrible things having made believed that they would make them strong. A teacher in the film, who took custody of these children having taken them back from the rebels said that it is in what one does that makes a person good or bad, although he would always ideally think that every person is good by nature. Vandy said he could understand what the white people would do to get the diamonds but he could not understand what his own people did. Archer asked if god would ever forgive men for what men are doing to each other but reflected to say that he felt god have already left the land a long time ago. The film is well paced and the scenes link well. I really appreciate the editing and effort done to piece the film together. I felt that the film has a lot of heart and moral. It was said that the colour of the earth was made red by the blood that was shed from the fighting that had gone about on the lands. I would feel that the “pink” diamond had also gotten its shade from the bloodshed. The children are like raw diamonds too, uncut and unpolished. But not all of them would be given the opportunity to shine with all the violence and killings surrounding them. Without proper guidance they will just end up to be diamonds mined for the purpose of money and war. It was not abrupt and neither was it a drag. It ends where it should and left a message quite clearly. This movie is a must watch because it dug down the surface and told us a real situation that had happened and is still happening because of conflict diamonds. I give thumbs up to the director, casts and the production crew for making this film so good. The scenes were well shot and I must say the music also struck a good note in complimenting the emotions of the film.